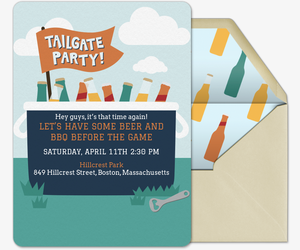 Get ahead of the game and gear up for your tailgating party early by sending a free or Premium tailgating invitation from Evite. 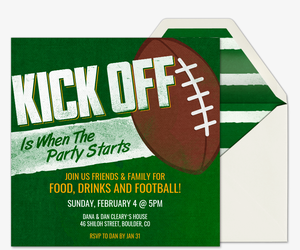 Browse dozens of football and sports-themed invitations designed to get fellow fans in the pre-gaming spirit. 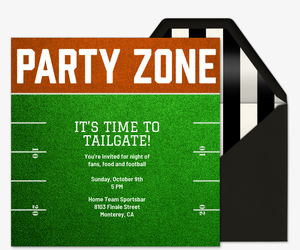 Whether your tailgate is at the stadium parking lot or right at home in front of the TV, start with a winning online invitation. 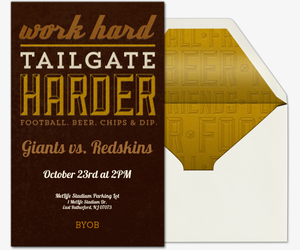 Set the tone for your tailgate by providing all the details and a custom host message on your invitation. 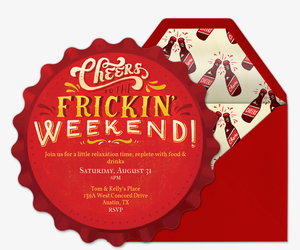 No matter how big your party is, paperless invitations keep it all organized. Track RSVPs, manage your guest list, post comments, share photos, and more, all from one digital invitation page. Or, keep in touch with guests on the go by managing your event via our mobile app. Organizing the contributions? Ask guests to BYOB and more using the “What to Bring” list. 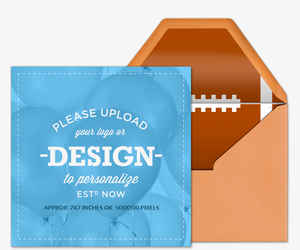 For extra cheer, kick off with a Premium invitation. Premium experiences are free of advertisements, and include complementary envelopes, digital stamps, and add-ons such as photo and text cards. Pricing is based on the size of your guest list. 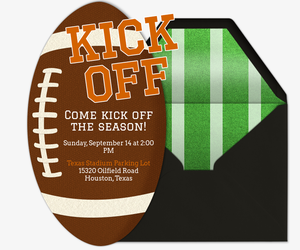 Team up with the pros at ideas.evite.com for tailgating essentials and other game day party tips. Check your trunk for everything on our tailgating packing checklist, then score extra points by recreating our tasty toppings bar or DIY football-themed beer pong. Better than beer? Get ideas from our list of top tailgating drinks to serve (besides beer). The party doesn’t stop with the tailgate. 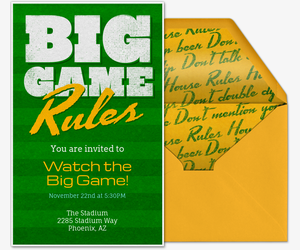 Head over to our Watch the Game invitation gallery, Big Game invitation gallery, or our Sports and Leagues invitation gallery for more game day invitations. Evite has invitations for all your other events as well, including birthday party invitations, holiday party invitations, wedding invitations, baby shower invitations, dinner party invitations, cocktail party invitations, potluck invitations, and more.